When we last left swordsman Cho Yi-Hang (Leslie Cheung) in the original Bride with White Hair, he was meditating on the snowy slopes of Mount Shin Fung. Due to Yi-Hang’s mistrust of his lover, Lien Ni-Chang (Brigitte Lin), the poor woman’s hair went from black to white and she slipped further into a bloodthirsty rage. Guilt-stricken by his betrayal, Yi-Hang stands ready on the frosty, precipitous mountain in the hopes of plucking a magical flower that may very well hold the key to healing his beloved Ni-Chang. In the meantime, Ni-Chang is content with slaughtering the remaining male members of the prominent clans. At the top of her list is Yi-Hang’s nephew, Fung Chun-Kit (Sunny Chan), the last descendant of the once-powerful Wu Tang. Chun-Kit takes a wife named Lyre (Joey Man), but their wedded bliss is short-lived when Ni-Chang pays a visit to the clan. The witch kidnaps Lyre, indoctrinating the newlywed into her cadre of lethal, quasi-lesbian women warriors. Naturally, our substitute hero leads a ragtag group band of do-gooders, including the beautiful Christy Chung as the tomboyish Moon, in an assault on the white witch’s inner stronghold. 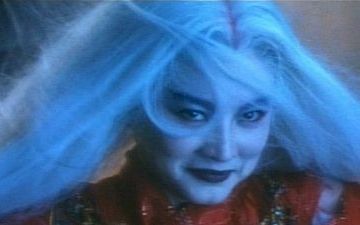 As the sequel to one of the best Hong Kong movies of the 1990s, The Bride with White Hair 2 had its work cut out for it. If you’re curious whether the honeymoon is over, check out my review here. I’ve even embedded a trailer of the second film under the cut. Told in flashback, The Bride with White Hair details the ill-fated love story of Wu Tang swordsman Cho Yi-Hang (Leslie Cheung) and Lien Ni-Chang (Brigitte Lin), the top assassin for the rival Supreme Cult. When we meet Cho at the beginning, we find that he has been waiting on a mountain for ten years in order to pluck the “majestic flower,” a rose that blooms every twenty years and can cure any illness. But at that point in the narrative, we don’t know his reasons. What unfolds next is a an exciting tale of divided loyalties as the heroic Cho finds himself falling for the “villainous” witch, who in turn comes to love him, a man she was ordered to kill by her hideous master, the misshapen Siamese twin, Chi Wu-Shuang (Francis Ng and Elaine Lui). Strong performances by Leslie Cheung and Brigitte Lin are just part of the thrill of this 1993 Ronny Yu film. The Bride with White Hair is a fantastic introduction to not only the fantasy swordplay genre, but to the HK film experience as well. The film is based on on a novel by Liang Yu-Sheng which was previously adapted into several films and a handful of subsequent television series. The character of Ni-Chang even appeared in the long-awaited Jackie Chan-Jet Li vehicle, The Forbidden Kingdom (2008). My very brief review was written early in my tenure at LoveHKFilm.com, so it’s not as in-depth as I’d prefer, but you get the gist — I liked it. I’d love to take another look at the film, if only someone would release a Blu-Ray to give me an excuse. Until then, you can read my barebones review here. You can watch the French trailer (with the alternate title Jiang Hu: Between Love and Glory!) under the cut.